In the wake of the allegations into Jimmy Savile’s life comes the extraordinary news that would have rocked the world of football. Spanish giants, Barcelona were set to sign children’s entertainer Jimmy Savile, with a view to him becoming their lead striker. 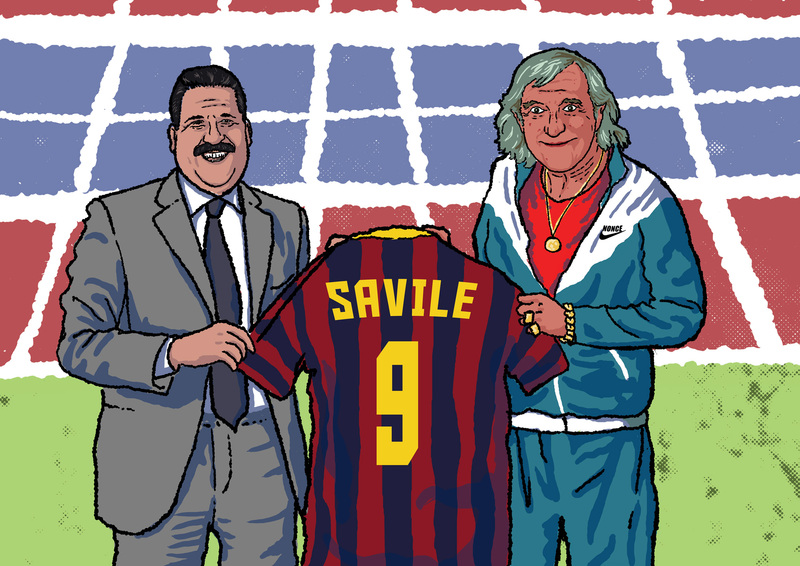 Savile, whose enormous football talent was understandably overshadowed by news of his predatory sexual behaviour, had been all set to join the Catalan club only one year before his untimely death. During his lifetime Savile was better known for his love of cigars, and his catchphrases which were followed by his signature bizarre yodel, but his lesser known talent lay in association football. Starting in Stoke Mandeville Reserves, and moving up through the league pyramid system, Savile was returning in excess of 30 goals each season for over 50 years. In late 2009, little more than a year before his death, Barcelona were strongly linked with him. Savile had always played down any interest in football, enjoying the more serene world of Marathon running, but insiders within the game knew a golden nugget when they saw one. Barcelona scout, Peter Thaap had been following his progress for years. When you finally tried to sign him, were you aware of his indefensible abhorrent actions? ‘Let’s keep things in perspective here; this is a man who was scoring 30 goals a season. We knew he was facing up to 1000 years in prison, but we put our best lawyers on it, and we think he was looking at missing maybe…four games, after the appeal.’ added Thaap.